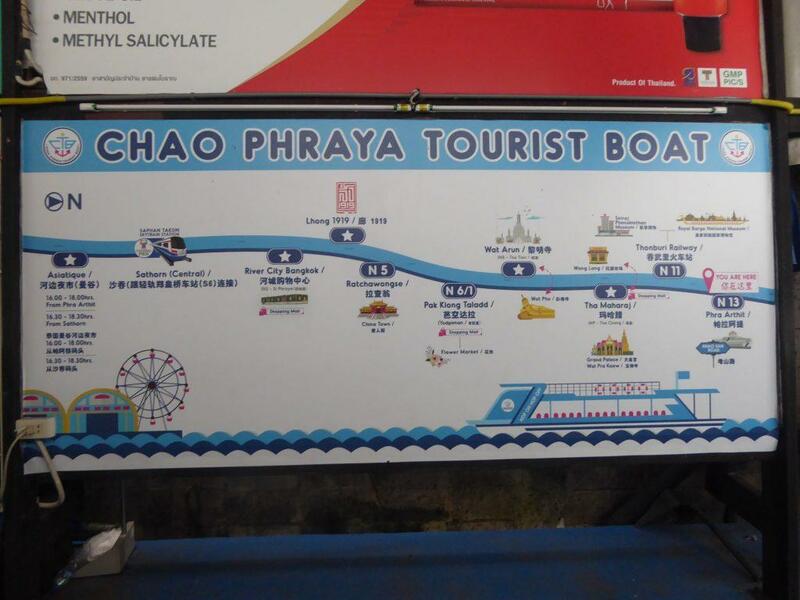 Bangkok River Transport consists of the Chao Phraya Express Boat & Bangkok Tourist Boat. They both run up and down the Chao Phraya river stopping at piers that give easy access to Bangkok’s riverside Tourist Attractions. This includes the Grand Palace, Wat Pho, Wat Arun, Chinatown, National Museum and Khaosan Road. 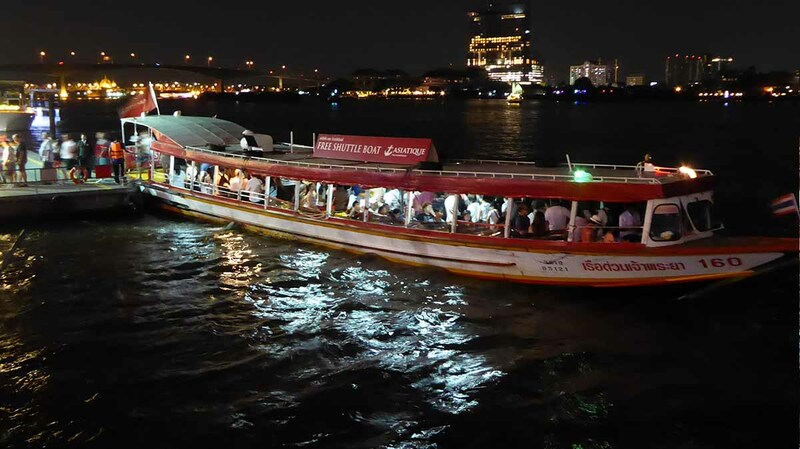 The Bangkok river boats also give access to Bangkok’s luxury riverside hotels and connect with the BTS Skytrain at Saphan Taksin. 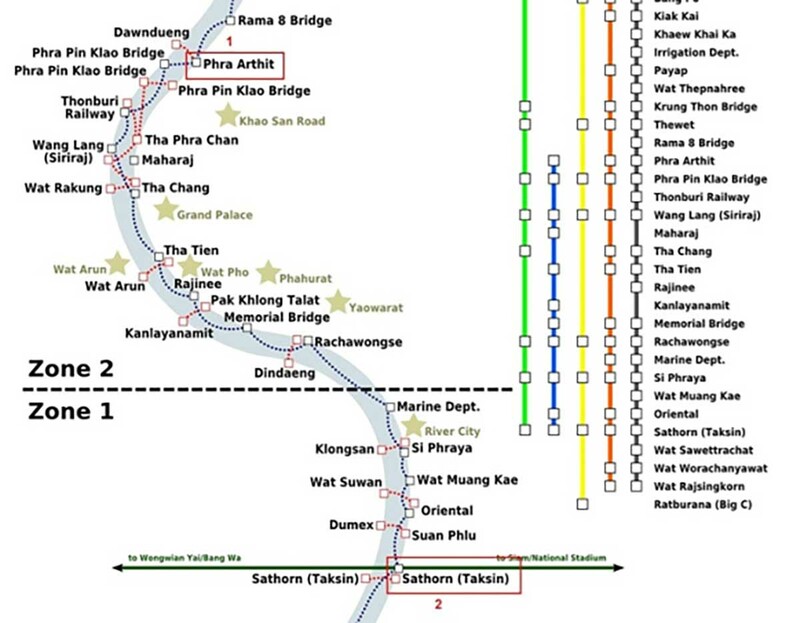 There are also, cross river ferries, private long-tail river taxis and shuttle boats operated by riverside hotels. 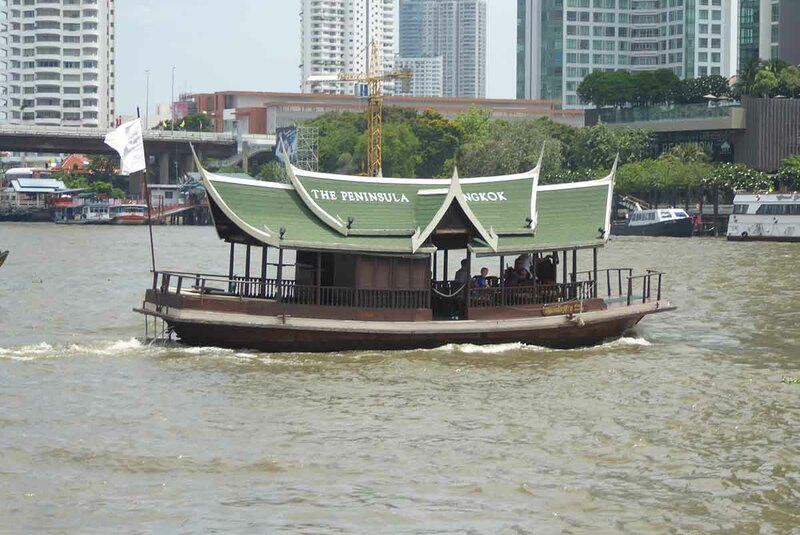 Getting around Bangkok by boat is a great way to see Bangkok’s riverside life. The Tourist or Blue flag boat is a special tourist boat. 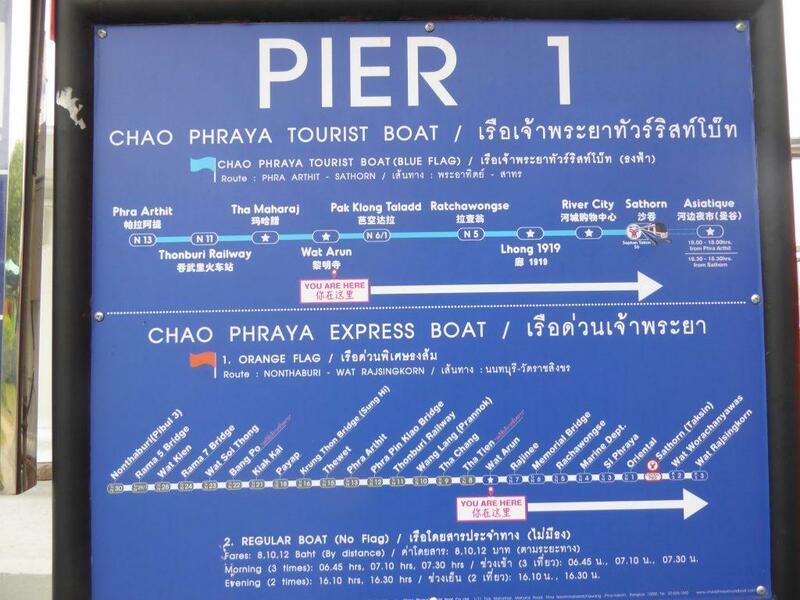 It runs between Sathorn Pier (Saphan Taksin) and Phra Arthit Pier (Khaosan Road) stopping at 9 piers which give access to nearby tourist attractions. The fare is 60 baht for a single trip ticket. There are three passes available. Number one is valid for a full day from 09.00 – 20.30. It costs 300 baht. Number Two is valid from 09.00 – 17.30 and costs 200 baht. Number three is valid from 15.00 – 20.30 and costs 200 baht. 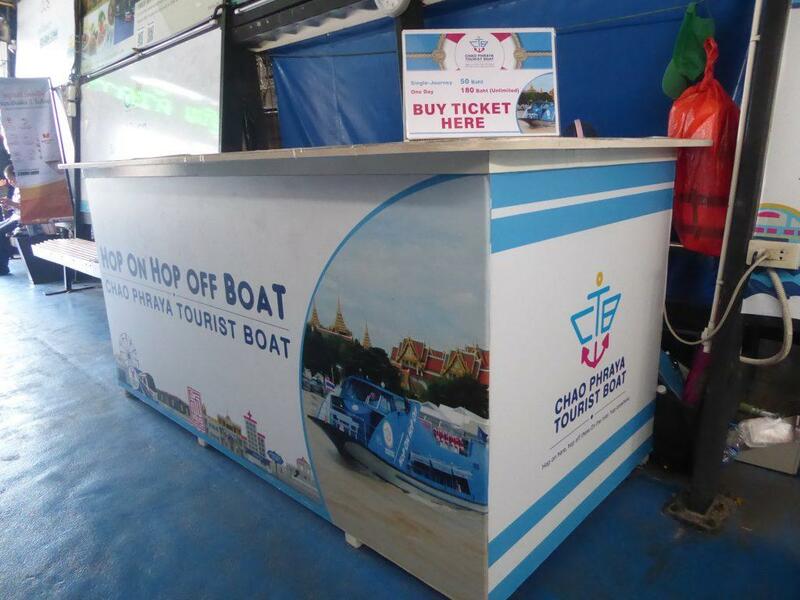 A Tourist Boat ticket counter is at each pier on the route. You get a free route map with your ticket. The service operates daily between 09.30-20.30 and the frequency is every 30 minutes. The service extends to Asiatique between 16.30 and 20.30. N* River City – River City Mall. Holy Rosary Church. Siam Commercial Bank. Royal Orchid Sheraton Hotel. 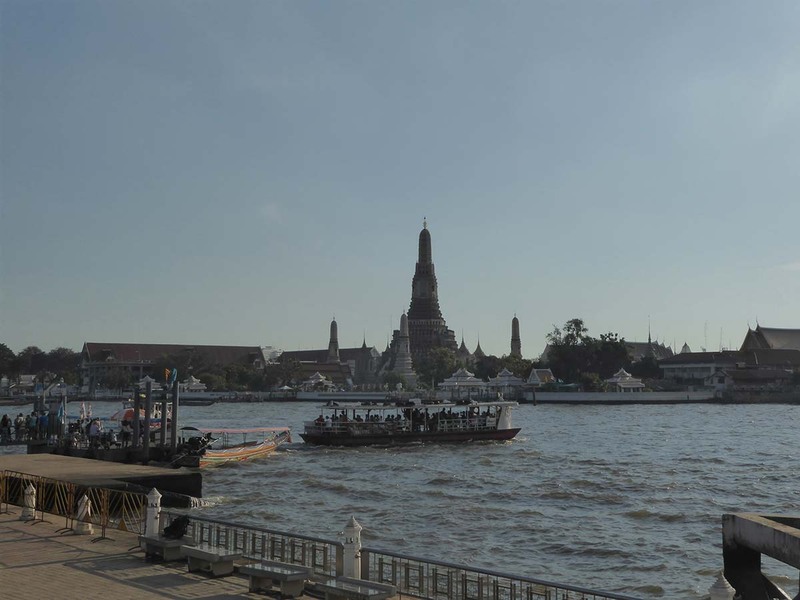 N* Wat Arun – Wat Arun. N* Tha Maharaj Pier – Tha Maharaj Mall, walking distance to The Grand Palace & Wat Phra Kaew, Sanam Luang and the National Museum. N11 Thonburi Railway Station – Siriraj Hospital & Museum, Wang Lang Market. Royal Barge Museum. 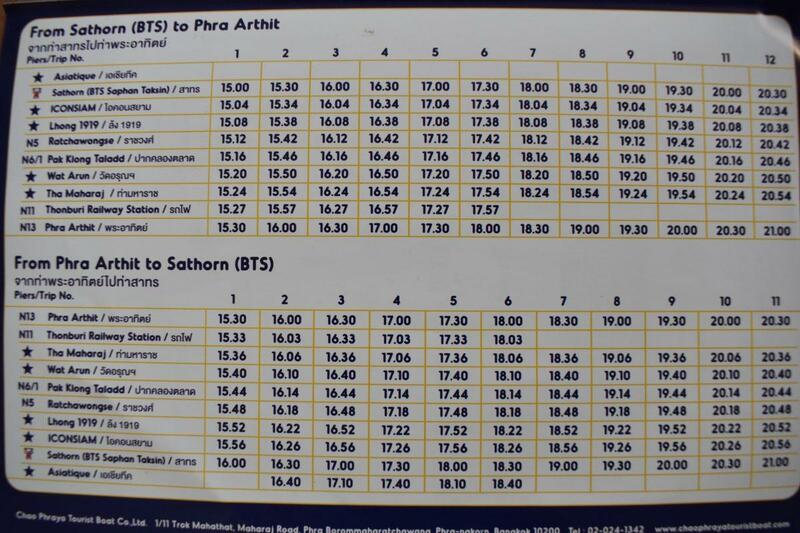 *Note that only the tourist boat stops at the Maharaj pier. If you are on the Orange flag boat get off at Tha Chang which is 100 meters away. 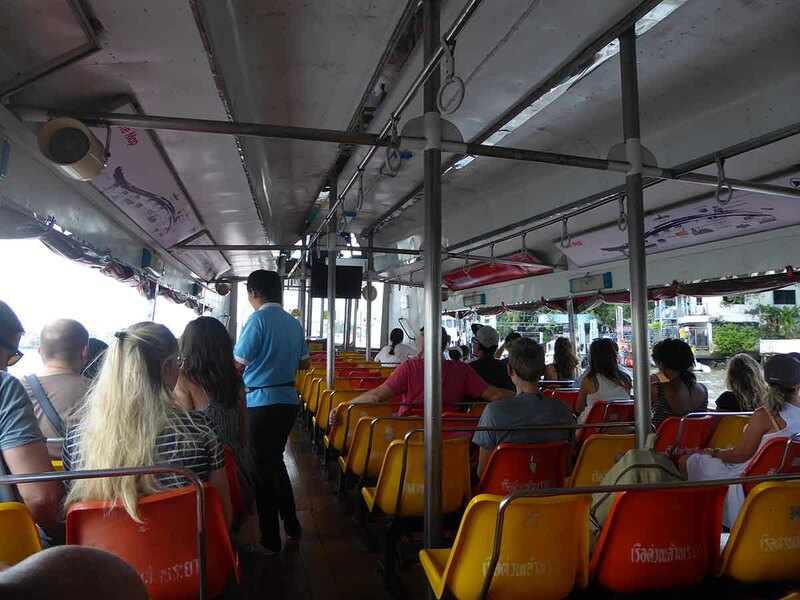 The Chao Phraya Express Boat is like a bus service on water. 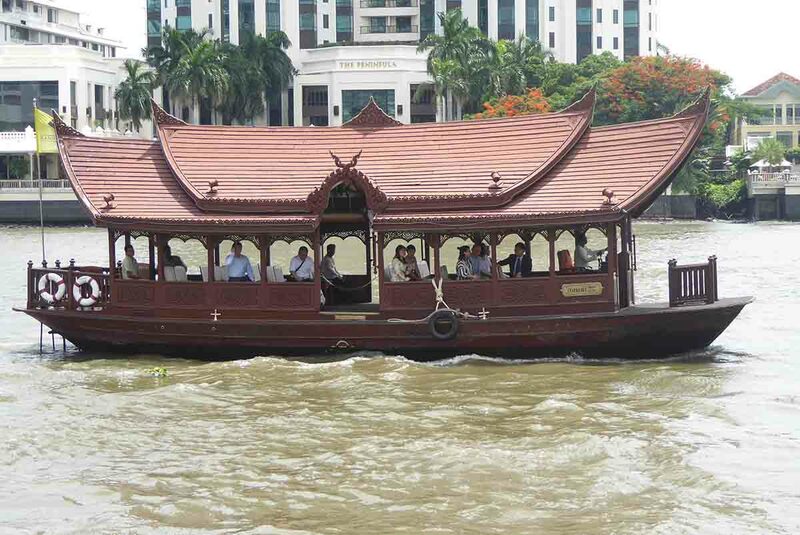 It operates on the Chao Phraya River running up and down via different routes. There are five lines which are color coded designated by a flag flying on the boat. The colors are Orange, Blue, Green, Yellow and no color which is known as no flag. The Green, Yellow and no flag boats only run during morning and evening rush hours Monday – Friday and are mainly used by local commuters. 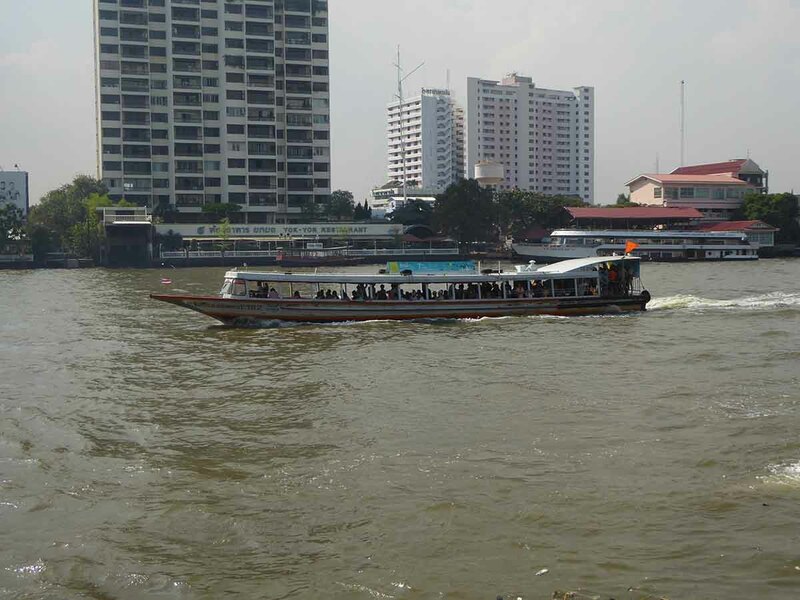 The best option for tourists other than the Blue flag boat is the Orange flag boat which operates between 06.00-19.00 daily running between Nonthaburi (north) and Wat Rajsingkorn (south) and stops at all the major tourist areas. The green, yellow and no flag boats only run during rush hour in the mornings and evenings. 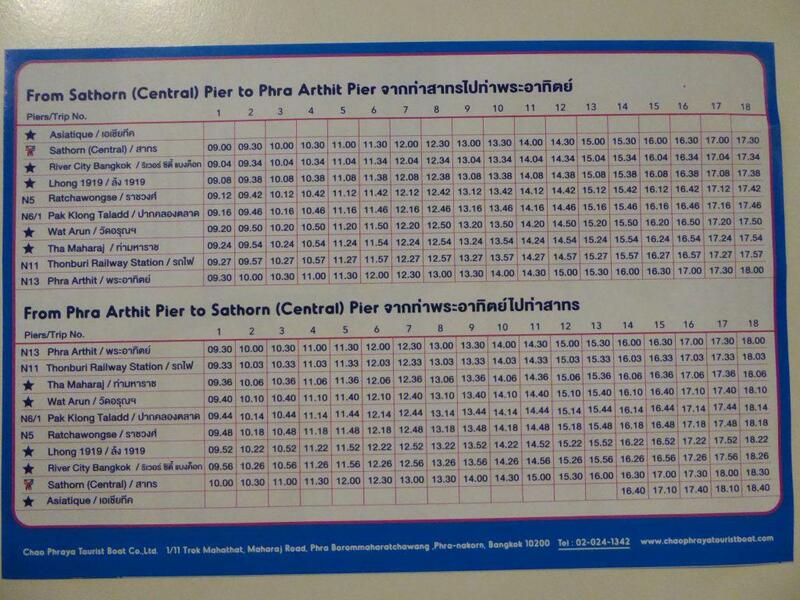 Tickets are 20 baht and you buy them either at a ticket counter/conductor at the pier or from a conductor on the boat. Keep your ticket for the entire journey. 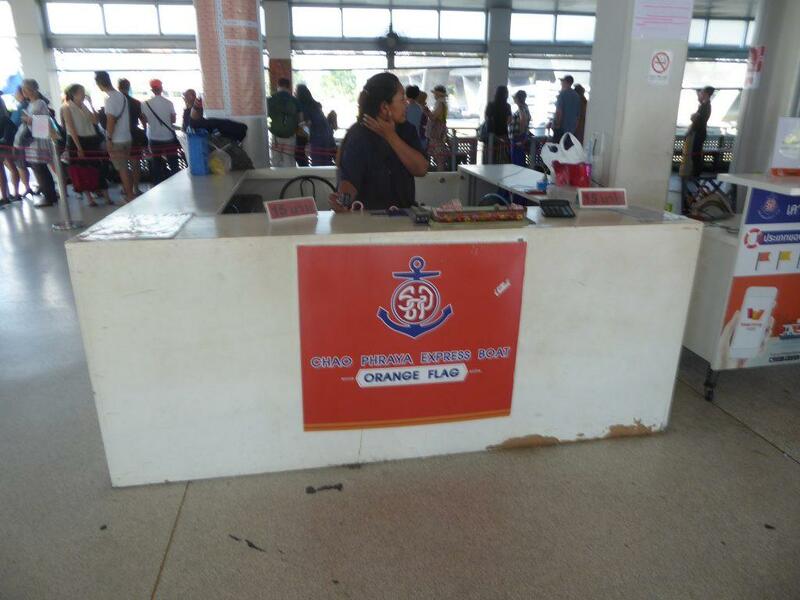 At all piers, you will find separate counters or tables selling tickets for the Orange and Blue flag boats. Service frequency is every 5-15 minutes depending on the time of day. Advantages of taking the tourist boat are that it’s more comfortable, operates longer hours, has more seats & is less crowded. There is an English-speaking guide who points out sights along the route and announces each stop in English. There is usually an open deck at the front of the boat where a limited amount of people may sit. Some boats also have an open upper deck. Altogether a more tourist-friendly experience. The disadvantage is that it’s more expensive, and the service is less frequent than the Orange flag boat. Some small ferries run as a shuttle between opposite sides of the river at certain piers. Some useful routes are .. The fare is 3-5 baht. Entrance is by a turnstile connected to a booth where you buy the ticket. You can hire your own long-tail boat for either a tour or a single trip. 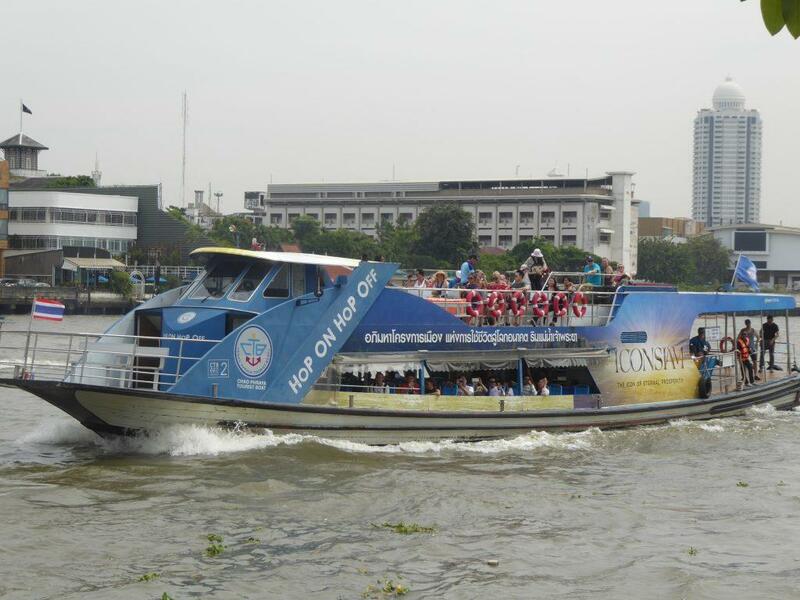 At most piers, you will find touts or official operators offering river and Thonburi side canal tours. You will need to negotiate the fare with the operator if they are not an official service. It can be expensive with hire rates between 1000 – 2000 baht for a 2-hour tour for a group of 4. Tha Maharaj and Yodphiman River Walk have permanent tour counters offering fixed prices. Smaller piers do not advertise prices so you will need to haggle. Watch out for touts who will try to overcharge you. 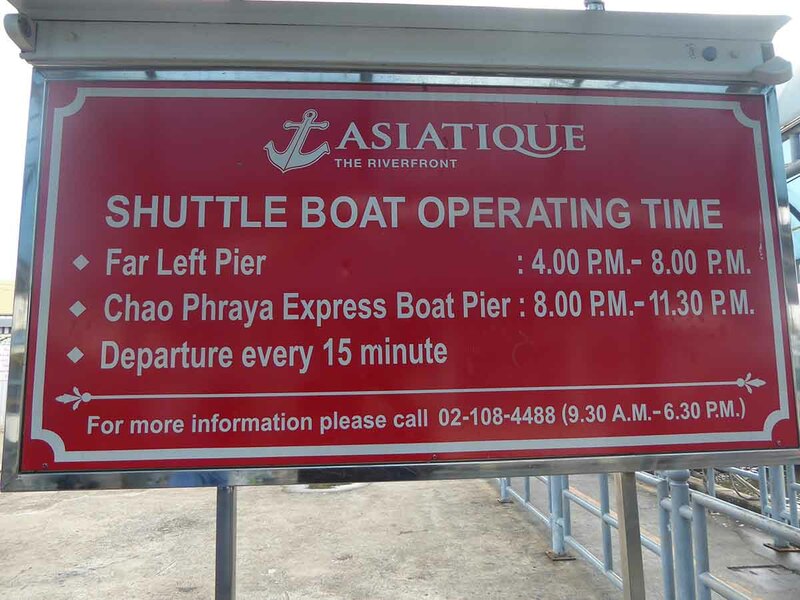 The Asiatique shuttle is a free service that departs from Sathorn Pier next to Saphan Taksin BTS station to Asiatique every 15 minutes from 16.00 – 23.30 daily. The Riverside area is home to many of Bangkok’s finest hotels. The Mandarin Oriental, Peninsula, Shangri-La, Chatrium, Anantara, Siam, Sheraton, and Millennium Hilton are all on the riverside. They offer free shuttle ferry services to the Sathorn Pier connecting with the BTS Saphan Taksin station. 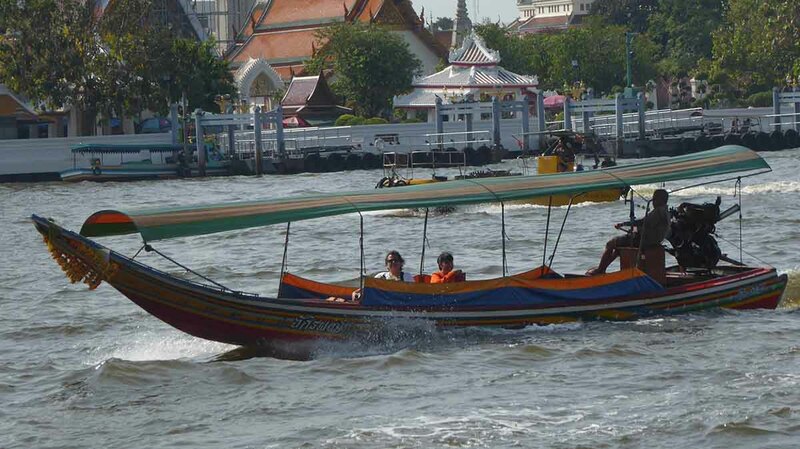 After 16.00 they also run complementary boats to Asiatique. The service is for hotel guests but anyone can use them. Check with your hotel for operating hours. Generally, they run from early morning until 23.00.